Historically, Lent is rooted in solidarity with the final stages of conversion of those who will be baptized at Easter. It became a time when the whole community engages in a deep, prayerful self-examination. 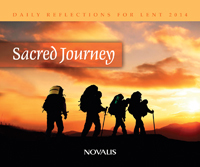 The traditional Lenten disciplines of prayer, fasting and almsgiving are designed to realign our heart’s desires to become more fully who we are in Christ. Our hearts get calcified – we harden them to the poor and needy of our world, our neighbourhood, or our household. Cynicism or selfishness adds another layer of protection to our vulnerability. Greed and resentment add another layer of stone. It all gets hardened in the pressure of modern life. Lent is the gift of “spiritual CLR.” God gifts us with time to relearn our identity bestowed by baptism into Christ – shared life of grace and glory. Together, as our hearts are softened, we discover beauty in brokenness, hope in vulnerability. Take my heart of stone, and give me a heart of flesh, O God. -Excerpt taken from Sacred Journey 2014 and was written by Bernadette Gasslein.